Old fashioned service on the new frontier! Now that I’m retired from academe, I plan to write a lot more newsletters. Poor you! But as much as possible each one will focus on one specific topic so hopefully they’ll be easier to plough through. Today, I want to focus on link trust (also being called TrustRank). But first, a reminder about the last one-way links partner page update. So far, almost all the folks I’ve heard from were the ones who’d faithfully done the previous update as well. So, I will be reaching out to the rest of you personally, save for those of you who’ve hired me to handle your updates. By now most of you have probably received at least one links program membership renewal report from me based on the analysis tool available from Majestic SEO. As you know, PageRank (PR) still exists as Google’s link trust algorithm, but is no longer reported to the public. Many commentators consider the Majestic SEO analyser superior to PageRank in terms of determining the genuine trustworthiness of a given website. But for any of you who have not received a Majestic-based report from me or don’t recall the details, let me remind you that Majestic uses something called flow metrics based on the relationship between two metrics, Citation Flow and Trust Flow. Citation Flow is more about quantity and Trust Flow is more about quality. Generally both are good but quality is more important than quantity. The relationship between these two metrics produces a trust ratio or score. The closer the trust ratio is to zero, the better. A score of 1.0 is excellent. A score of 5.0 or 9.0 suggests you have way too many low value citations and not enough citations that carry trust. So, the trust ratio is designed to illustrate how trustworthy a website is as a destination. It’s trust ratio is 0.8 (64 citation flow divided by 89 trust flow). Like I said, it’s better to have more trust flow than citation flow. The New York Times has links from 116,000 referring domains and a lot of them don’t have much trust. But a lot of them do have trust and that’s what gives the NYTs a very good trust ratio. 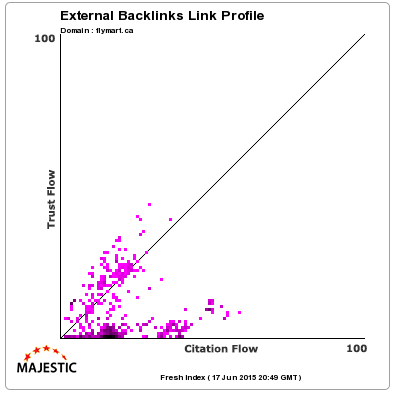 “The trust flow of almost every site or link is less than the citation flow. Why? A site may have tons of backlinks. But, not all of them are high quality and have TRUST. Even though you strictly make sure that you have only quality backlinks, there will be low-quality backlinks that are generated automatically by various directories or other sorts of backlinks. So, to Google and other search engines, high trust flow (though hard to get) is a clear sign of having high-quality content. The logic being, you must have high quality content or folks, who themselves are trusted websites, wouldn’t be linking to you. I wanted you to read the above verbatim because probably 80% of our program membership has something almost unheard of, our membership overall has higher trust flow than citation flow. Over the last few months I’ve done dozens of membership renewals and reviewed dozens of reports from Majestic SEO. Our program average is somewhere around 0.7/0.8. The worst score I’ve seen amongst program partners was a 1.5 (one instance of this) and the best was 0.6 (many instances of this score). But then one day, one of you asked me a rather interesting question I’d not even considered. This was from a guy with a really excellent trust ratio score of 1.0. He asked: “how can I get lower than 0.5”. Doh, some people are never happy. LOL! But I couldn’t argue with the question. Let’s see. Here is the Majestic graph for a site that just enrolled in the program. Its trust ratio today is 11.0. A year from now, if the current patterns hold, the site should have a trust ratio of 0.8 or so with our program links crowding the centre axis and edging closer to the trust axis and away from the citation axis. You can see a few low value citation flow links crowding along the citation flow axis but many more crowding the centre axis and edging up to the trust flow axis. In the first 50 links for this site all but 4 are program links and the ones that are not program links have zero trust. Maybe if you squint, you can see a few red dots along the bottom citation axis. This is supposedly a real website with about 4 back-links but no trust. A lot of links service providers create fake “industry related” websites and innocent folks buy into these services without ever questioning whether the sites themselves have any trust. Some of them are so well done, the only way to tell they’re fake is to use the posted contact info to call them. Of course, not having fake contact info is an example of a poorly done fake site. LOL. I don’t know how to get closer to 0.0 or better than 0.5 but just yesterday I did a renewal that had a trust ratio of 0.5 but, by a whisker, it rounded up to 0.6. It was the best result I’ve seen so far and it was a site that was pretty much only in my program. But I don’t want to create the wrong impression here. A varied links profile is the best; you just have to be careful where the links are coming from. A lot of older sites have a mixed history due to historic linking practices (e.g. spam directory links, spam blog links, links from fake websites, link farms, etc.) But even for these folks, our program improves trust and puts a better “face” on a questionable past. LOL. But let me reiterate, the “worst” trust ratio I’ve seen in the program was a 1.5 and that’s considered excellent by Majestic SEO. One of my goals in the coming months is to figure more ways we can help one another especially with social media. Today, I will make a modest start on that just by profiling one of our program partners.